Why does Gatesville ISD need an education foundation? The state provides basic funding for public education, and mandated education. Local school district citizens provide additional support through taxas. This provides the "basic" classroom for students. Exceptional teaching and innovation above and beyond basic funding can be provided by your donations to create excellence in schools and increase community support through directed donations. I already pay taxes to support public education, why do schools need additional funding? Tax dollars support mandated basic education. Foundation funding enhances the educational system, making it possible to offer Gatesville ISD students additional opportunities and create partnerships with the community to make education a local priority. 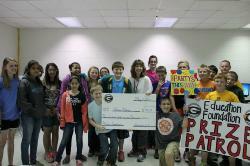 How does the Gatesville ISD Education Foundation support students? The Foundation supports student programs, projects and initiatives that do not receive tax-based funding. It also promotes and recognizes academic excellence by students and innovative instruction by teachers and staff. Who controls the Gatesville ISD Education Foundation?The Foundation is governed by an independent, volunteer Board of Directors including business and community leaders, parents and alumni in the Gatesville ISD community who are committed to our schools' success. While the Foundation operates independently of Gatesville ISD, it shares a vision of educational excellence and student achievement. What is the tax status of the Gatesville ISD Education Foundation? The corporation is organized exclusively for educational and charitable purposes within the meaning of Section 501 (c)(3) of the Internal Revenue Code. The Foundation shall receive and disburse funds, property and gifts of any kind exclusively for the benefit of Gatesville ISD. Can private schools and other education programs apply for Gatesville ISD Education Foundation support? No. The GISD EF is exclusively dedicated to supporting programs and excellence within Gatesville ISD campus'. Can I make a dedicated donation (memorial, program, ect...)? Yes. You can donate in honor or memory of someone. You can donate to support a specific academic or innovative program. However, funds cannot be used to support extra-curricular programs such as band, sports, FFA, and others, even if they are supported in the district. However, extra-curricular programs at GISD have active and supporting booster clubs that you CAN make donations to through the District and dedicated booster activity channels.